The 15" LED scanner bar can be used as a 3rd brake light, a security scanner for alarm systems, behind your grill, use it in your rear window as a high-visibility scanning third brake light. The possibilities are endless. Features 30 micro-processor controlled LED's for fluid scanning motion. When an alarm is set, it will scan back and forth. The best thing about the LED scanner is that it can be powered by a single AA battery. This can also be cut off and the item hard wired to any standard 12v source. Available in Red, Blue, green, purple and white. 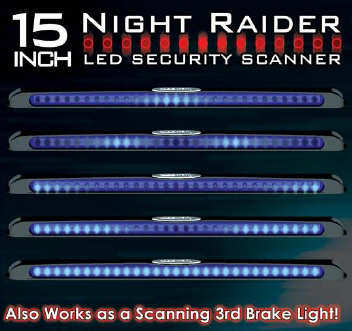 Once again, the Night Raider LED Scanner kit is backed up with the PlasmaGlow Lifetime Warranty and Rated for Interior or Exterior Use. Simple 2-wire Hook-up. Installation & mounting hardware and instructions included.